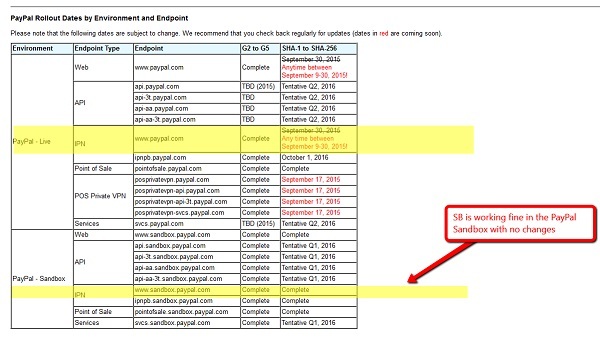 If your website consumes PayPal IPNs (Instant Payment Notifications) then you will probably have received an email today, September 11th 2015, with the subject: “IMMEDIATE ATTENTION REQUIRED: PayPal service upgrades”. The English grammar in the email is a little dodgy in places but it is not a scam, it is really is from PayPal so you need to take action and make some checks. 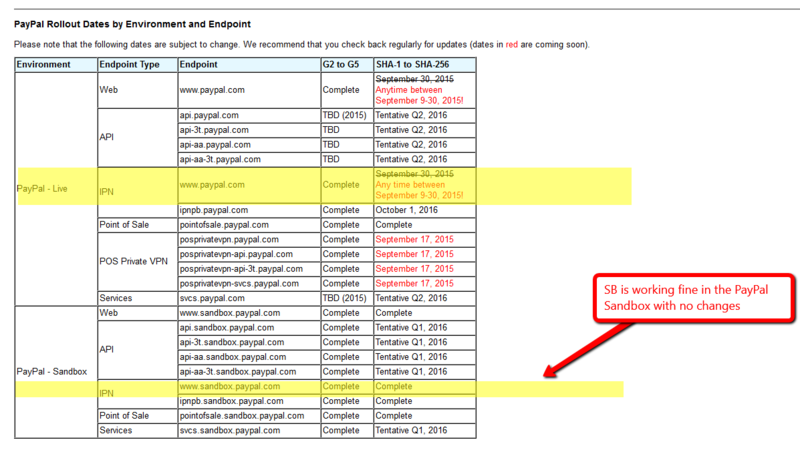 Two upgrades are taking place at PayPal before the end of September 2015 which affect processing of PayPal IPNs. SHA-256 Compatibility is provided (or not provided) by your web server. Most likely you are running Apache 2.x and so you will be fine. However you should check your server is on the first list and not the second list. 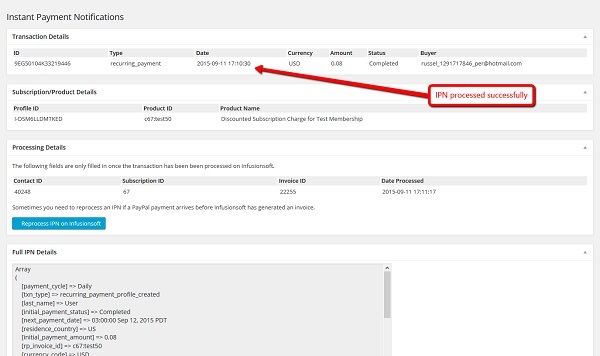 PayPal have already upgraded their Sandbox area as indicated on their SSL Certificate Change Microsite so it is a matter of a running a test transaction using sandbox API keys instead of live ones and checking the IPN is processed. I made a subscription purchase in the PayPal Sandbox and the IPN was handled just fine. So if you’re NOT running an unusual or really old WebServer, then SubscriptionBoss handling of PayPal IPNs should be unaffected by the PayPal certificate upgrades later this month. If you are unsure about your server’s SHA-256 compatibility then get confirmation from your host or webmaster. To be 100% certain take PayPal’s advice and run some tests in the PayPal Sandbox and make sure the IPNs are processed successfully. Digicert have a whole section on their website about SHA-256 migration if you want to get deep into this subject. This includes a download of a DigiCert Certificate Agent Scanner which you can point at your websites to assess their readiness for SHA-256 as well as their general security. This is aimed at the webmaster rather than your average business site owner. But geeks will love it!